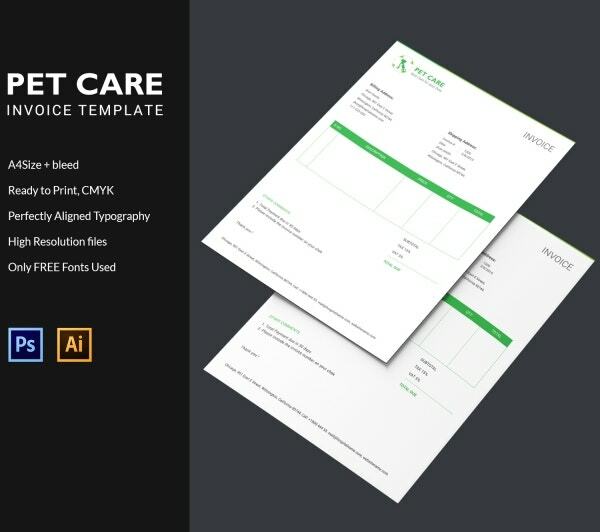 If you’re in the pet care business, or if you run a veterinary medicine practice, then you’re surely going to appreciate these templates. All the templates have been designed by the experts keeping your needs in mind. 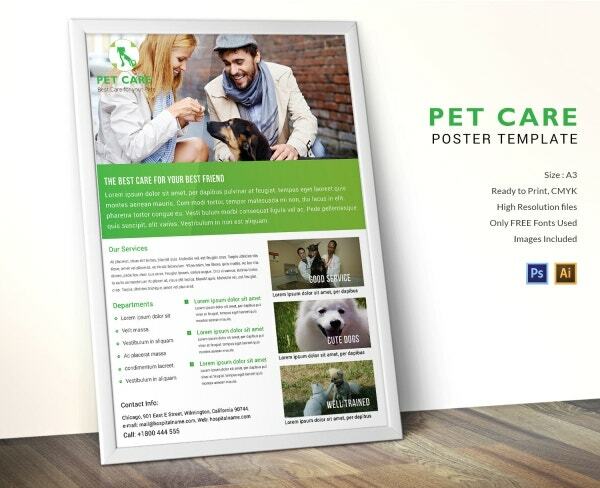 Most of the templates that you find here would help you design posters, flyers, brochures, postcards and so on. You would be able to customize them any way you want in order to fulfill your needs. Most importantly, the templates are all set for printing. 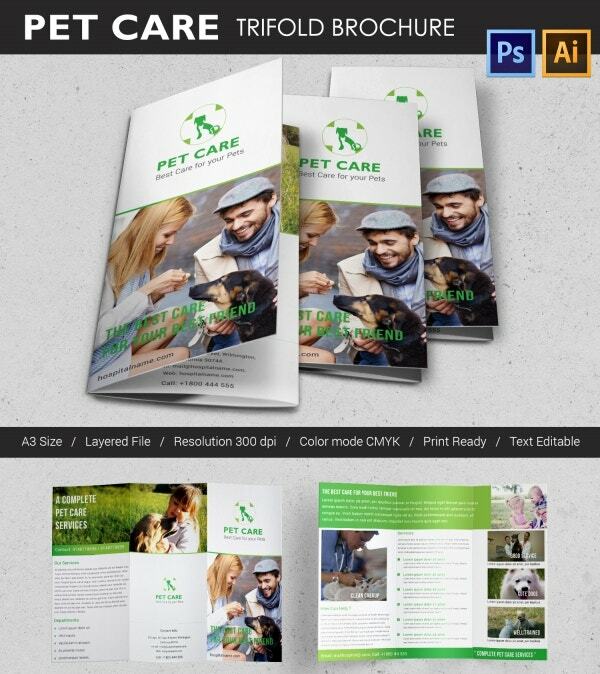 You can also see Animal & Pets Themes & Templates. A tri-fold brochure would allow you to accommodate as many details and bits of information as you want into it. The template has been kept neat and tidy here and that makes it look all the more professional. Also, the template is fully customizable and editable for you to personalize. 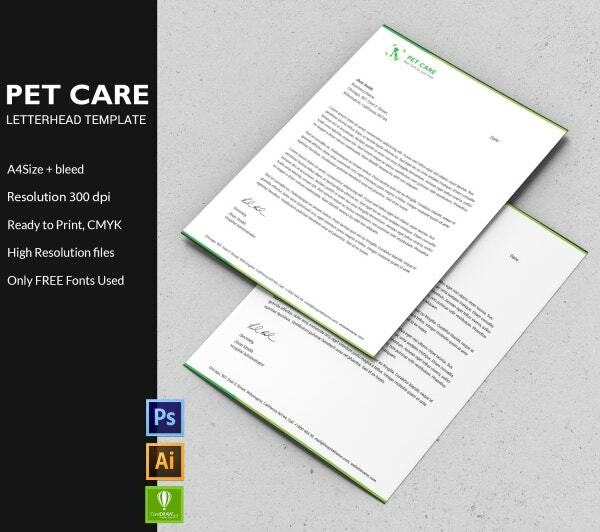 If you want to keep your brochure or pamphlet as simple and short as possible, then you could take the help of this template. The template starts off with a really attractive image which is sure to catch your eye. It also provides relevant information in an organized and neat fashion on both the pages. 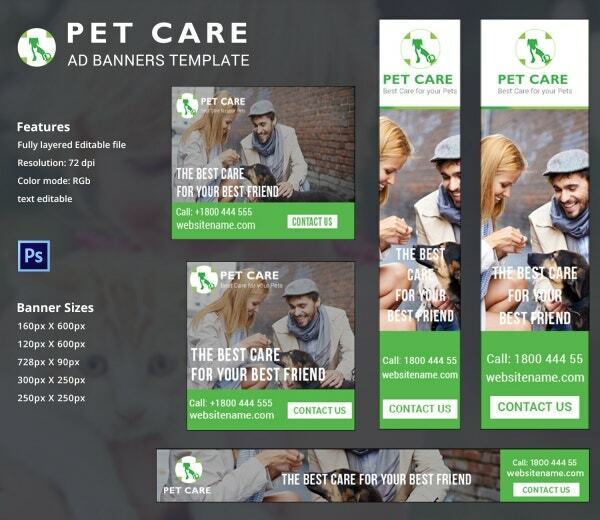 If you’re planning to advertise your pet care services, then you could take the help of this template. Here, you will be getting five ad banners to choose from. As a matter of fact, you would be able to use each banner for different reasons. They all come in standard sizes and in a resolution of 75 DPI. 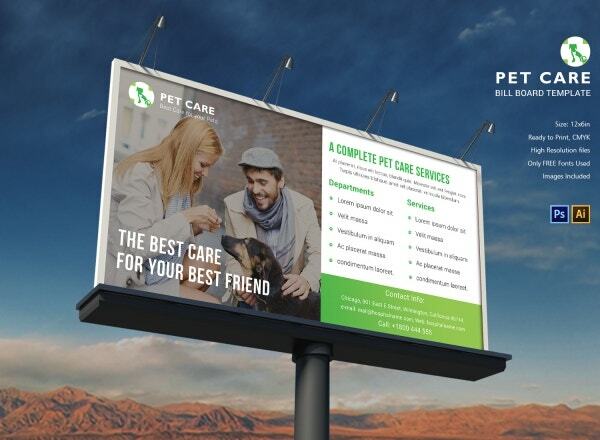 Planning to advertise your pet care services on a billboard? Then you really cannot afford to miss out on this template. The template comes in a standard 12 x 6-inch size and is fully customizable. Also, you would be getting the images you see here as part of your deal and would also be able to use the free fonts. 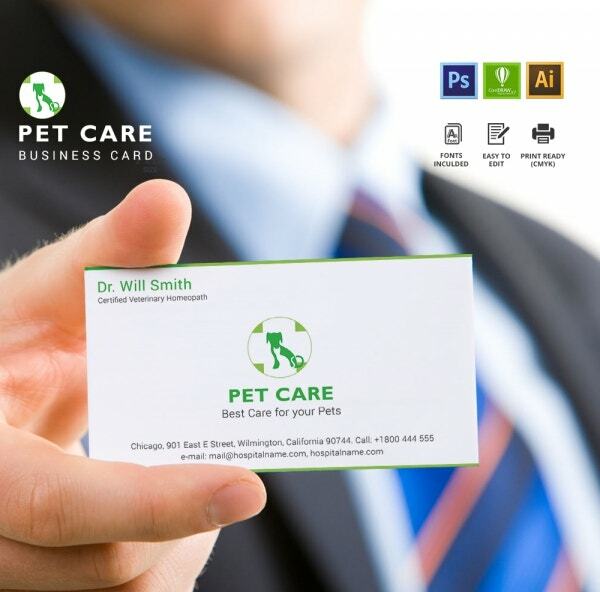 Every pet care service provider or even veterinarian would have a business card of their own. 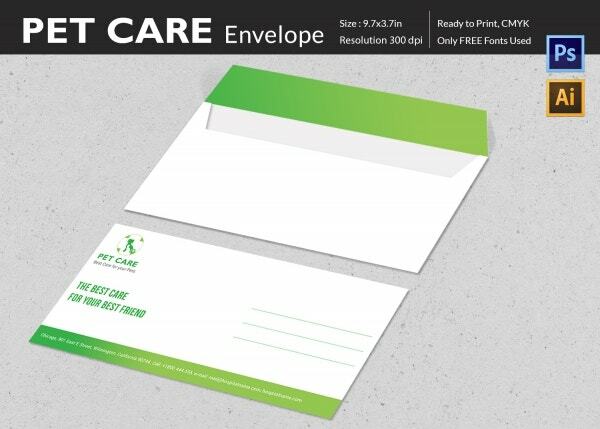 If you’re planning to create a business card for this purpose, you can use this template. The template looks really simple and elegant, owing to its plain white background with a green border which is a nice touch. 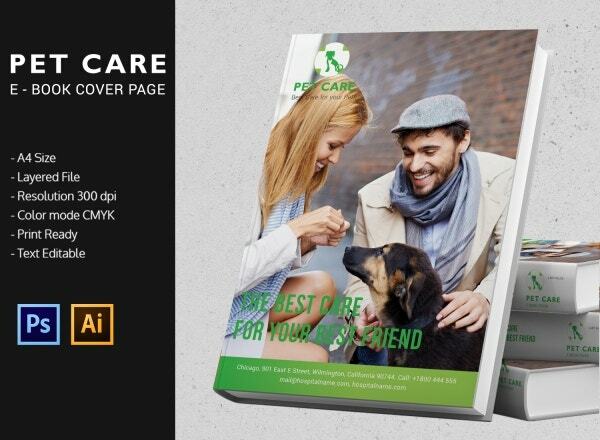 The template that you see here would be perfect if you’re planning to create an ebook cover page. The cover page comes in a size of A4 and in a layered file. You would also be getting a fairly high resolution of 300 DPI and editable text along with the template. Apart from the customization, the template is ready for printing. The envelope that you see here is really professional and has a formal touch to it. That’s why it would be perfectly suited to your purpose. 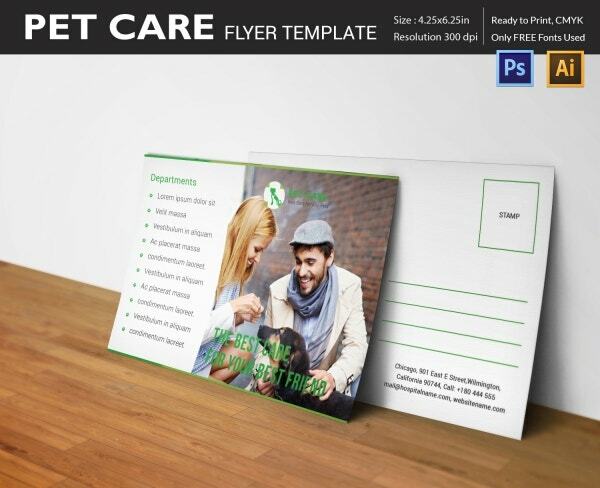 The template comes in a standard size of 9.7×3.7-inch and in a layered file as well. Also, the template comes with cool fonts which you are free to use as you please. A flyer resembles a brochure or pamphlet in a number of ways. The flyer that you see here is informative and focuses a lot on the text. However, that has been perfectly balanced with an image which is sure to catch your eye. 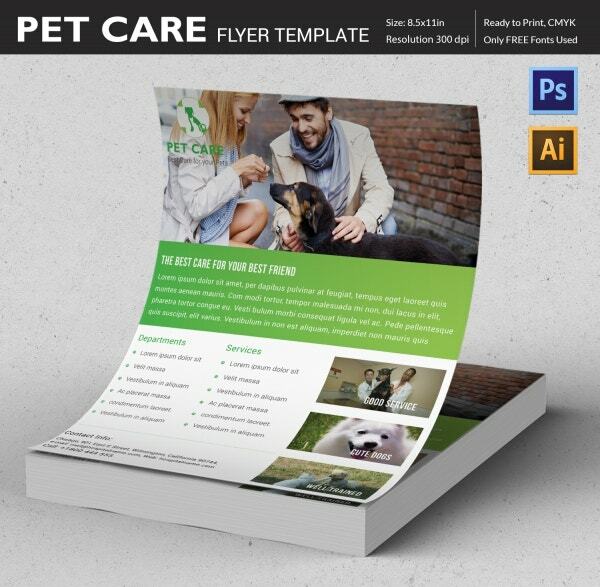 The template which is fully customizable is all set to be printed once you’re done editing it. 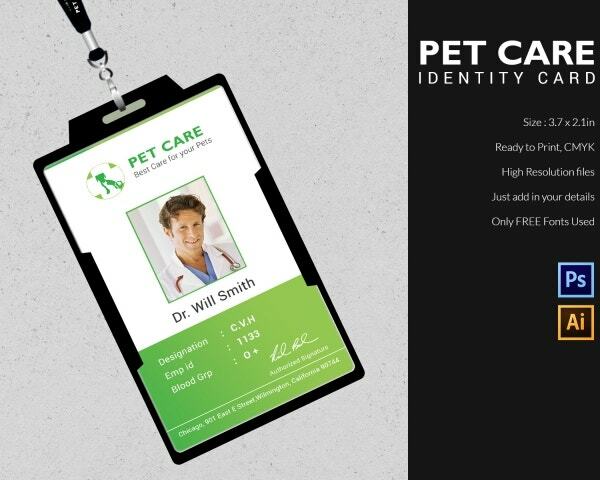 If you’re working in pet care, you would be needing an id card. To create one for yourself, you can take the help of this template. Once you download the template, you will be able to add all relevant details that your id card needs and you would also be able to add images. That makes this template exceptionally easy to use. When it comes to invoice or money receipts for pet care services, you need to follow a specific format. If you’re not sure of it, you can refer to this template. You will be able to download the template and then start filling in your details. You would also be able to print them and use them in any way that you deem fit. 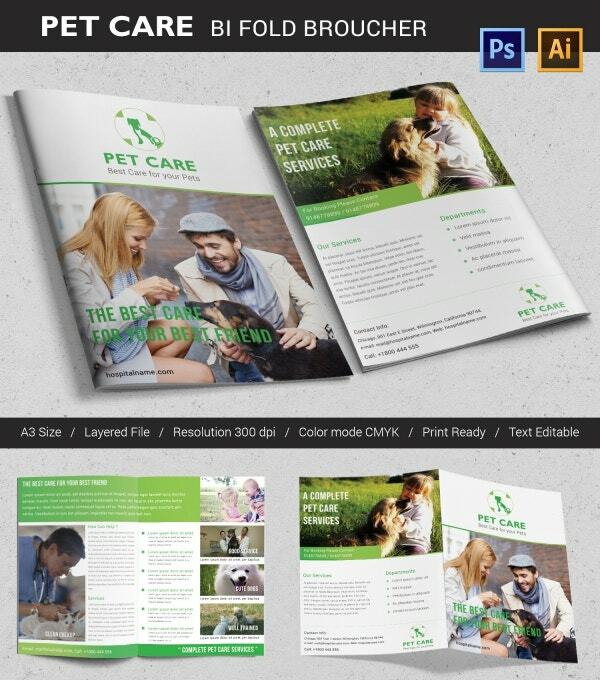 For any pet care service provider, it would be imperative to have a letterhead. If that’s what you’re looking for, then you could take the help of this template. You would be able to use these high-resolution files in a layered format in the template and also make the most of the free fonts that come with it. The template that you see here would be perfect if you want to create a flyer. The best part about this template is that it has been kept as neat and tidy as possible. You would be able to organize all your details in a neat fashion here. Also, the image you see here and the free fonts are part of the deal with the template. Creating a poster can be a tedious job but not with this template. Here, there is a perfect balance created between the textual aspect and the images. As you can see, the text has been presented neatly in the form of bulletins, which is always appreciated. You would be getting high-resolution files here all set for printing. 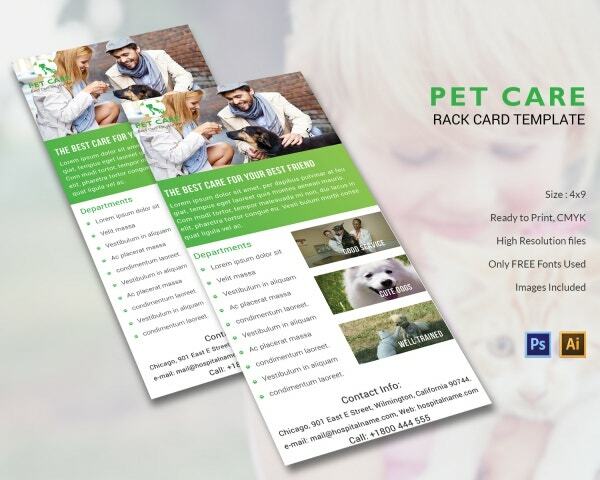 In the rack card template that you see here, you get to showcase your pet care services in a proper fashion. You would be getting rack cards in a 4 x 9-inch size and in a layered file. 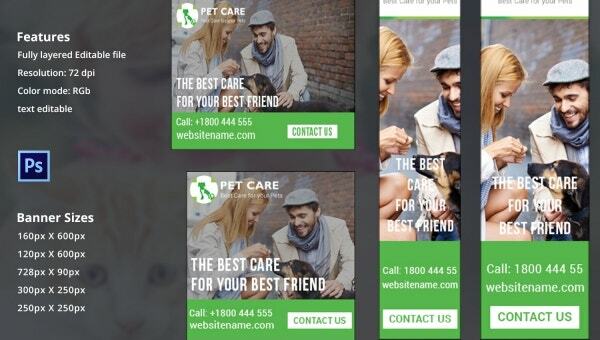 The template also contains high-resolution files and free fonts. The images that you see on the template are part of the deal. 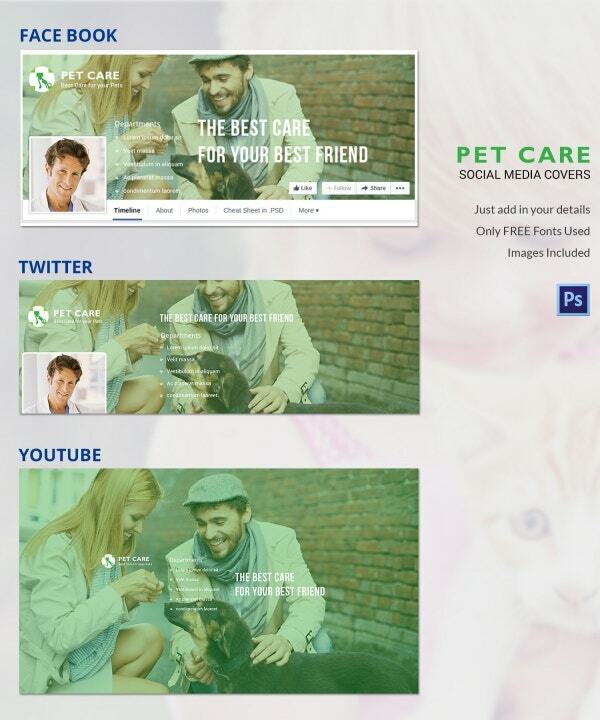 The best way to advertise your pet care services would be through social media. In case you’re planning to use either of the three platforms, Facebook, Twitter or YouTube, you can use this template. It would help you create a specialized cover page for each of the platforms and you would be able to personalize and customize them the way you want to.